Datsun is preparing the next phase of its development with the global reveal of a concept car – Datsun GO-cross Concept. The Datsun GO-cross concept is the cool crossover that brings a new sense of style, adventure and fun to the Datsun line-up. It was specially created to meet the needs and preferences of a new generation of drivers – young, ambitious, fun-loving people who are moving towards their dreams and next stage of their lives. They want the freedom and opportunity that a car ownership provides. They want a vehicle that reflects their personality and aspirations, and fits their lifestyle. Just like these drivers, the Datsun GO-cross Concept had spirit and a sense of adventure. It can deal with the day-today routine and still have plenty of energy for holiday or weekend fun. It can handle city lifestyle easily, but it also loves the great outdoors. The new concept, already the second one from the brand Datsun redi-GO Concept presented in February 2014, hints at a possible direction of Datsun GO/GO+ family range expansion in high-growth markets. 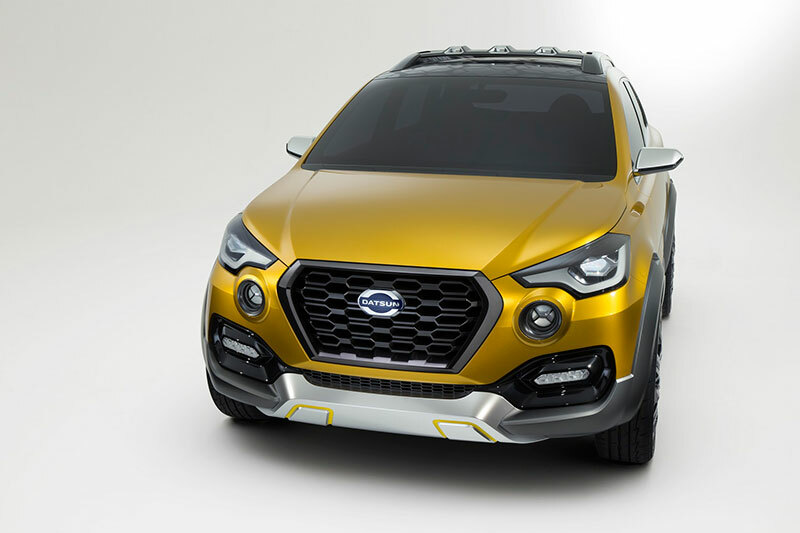 If it were to go onto production, Datsun GO-cross Concept would effectively create a new segment in its market and attract a new audience to the legendary brand. Fusing distinctly modern design elements with Datsun’s hallmark design language, the GO-cross builds on the acclaimed Datsun GO+ family three-row MPV. In this way, it follows Datsun’s philosophy of designing cars to answer specific market needs at an attractive price. Designed by a dedicated Datsun team in Japan, the Datsun GO-cross Concept clearly sets itself apart from the Datsun GO+ event though both share the same platform. said Koli Nagano, executive Design Director, Datsun. For Example, the Datsun GO-cross Concept has a rising shoulder line with a bold ‘flick’ that curves towards the tailgate to provide a clear link to the existing MPV, but it is more dynamic and defining on the newcomer. Indeed, in most respects the Concept is a stand-alone project with its own stance, attitude and style… and a possible pointer to the brand’s forthcoming design language. The now familiar Datsun D-Cut grille became larger, more imposing and more expressive. Furthermore, it is placed in a more upright position to accentuate the higher bonnet line and has a dramatic ‘black-chrome finish designed to underline. The car’s tougher role. Other distinctive features include dramatic LED headlights and LED tail lights to lend a high tech look to the front and rear of the car. The massive bonnet and taller body sides give the crossover concept a robust and aggressive stance, which is accentuated by the 4X4-style wider fenders and extensive body cladding. The cladding extends down both sides of the car and includes sturdy underbody guards under the grille at the front and beneath tailgate at the rear. Although not envisaged to have four-wheel-drive, the Datsun GO-cross Concept has a higher ground clearance than Datsun GO+ to enable it to handle rougher terrain with an extra degree of confidence. This is accentuated by the dramatic five spoke 17-inch alloy wheels and sturdy underbody guards which add to the concept’s rugged yet refined appeal. In contrast with the robust lower half of the car, the top half underlines the dynamism of the design, with gentle curves that are replicated in the side window graphic. The result is a beautiful silhouette that balances sleekness and utility. Among its practical features is a fully integrated aerodynamic roof rack that sits atop the black painted roof. The latter features a patterned graphic inspired by the Datsun brand logo which could become part of an extensive personalization programme. 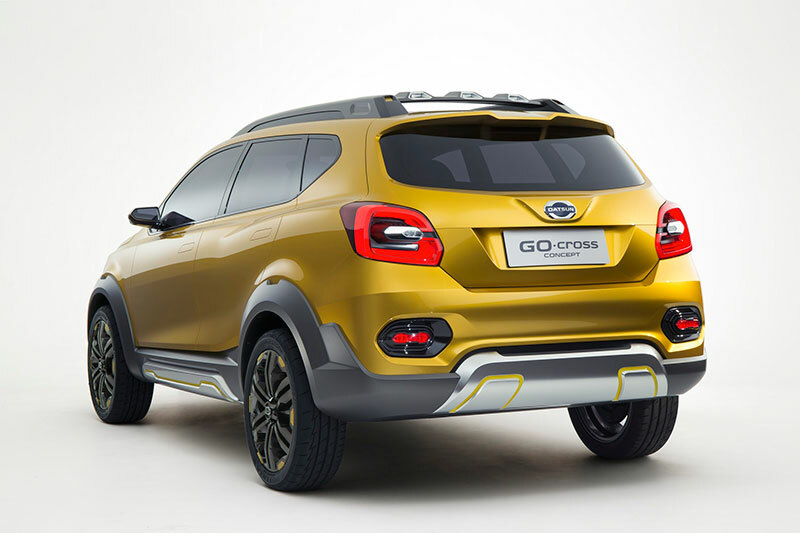 Ensuring it stands out, the Datsun GO-cross Concept is finished in a vivid bright yellow colour. Stimulated by spectacular nature, glorious sunrise, blessed flying birds and bright flowers, it boldly expresses passion and vigour, brand promises Datsun is committed to deliver. Although clearly built for adventures, like Datsun GO+, our new crossover concept has also been created with practicality in mind. There’s ample space inside for families and friends travelling together. The usefully sized luggage area is complemented by the extra luggage capacity offered by the roof rack, while the higher ground clearance and tough exterior cladding mean it will be able to cope with everyday road and traffic conditions in the country. The result is a distinctive compact crossover that is modern, reliable, fun and attractive… a car that reflects its owner’s sense of achievement and equally reflects Datsun’s core values of Dream, Access and Trust.